Just regular folks. : Post - thanksgiving. 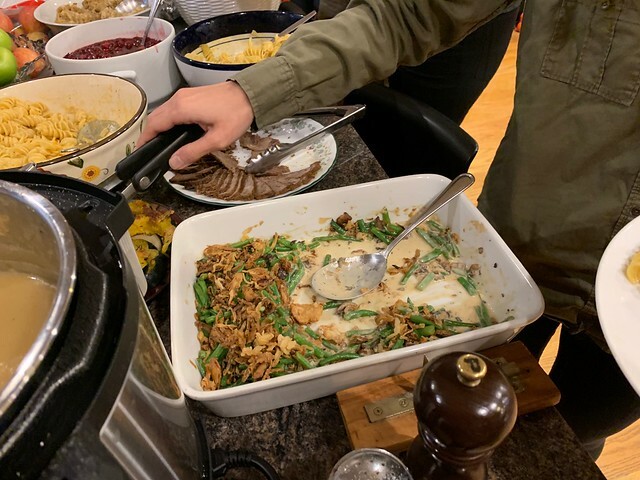 Vince made this green bean casserole from scratch yesterday. He followed the Binging with Babish recipe which included making the mushroom soup from scratch, deep frying the onions and then putting it together with fresh green beans. I wish I had gotten a photo of it as it came out of the oven, but I didn't. It was amazing & delicious it was the first dish that was completely consumed. One of the reasons that our house was so crowded yesterday was because so many of Edda's caregivers and their partners and families came. I grieve about so many things regarding Edda, but when I think about the nice things that have come out of it one of it is that we have so many people interested in Edda's wellbeing and that they have become like family to us. My mom pulled her groin muscle yesterday and so she and my dad had to cancel and stayed home yesterday. My dad dropped off all the egg roll ingredients anyways mid-afternoon. It was weird not having either set of parents at Thanksgiving, but it was fine. We are going to bring over the leftovers to their house tonight to have a 2nd Thanksgiving with them tonight (minus the green bean casserole). I had this secret hope that Donald would show up on my doorstep at 4pm on Thanksgiving, but that didn't happen. Donald! I miss you, I love you, come back to me. <3 I will wait for you, take your time. Happy Turkey Day. 35 are you kidding!! You people are either seriously nuts or super organized. That green bean dish looked amazing!! !